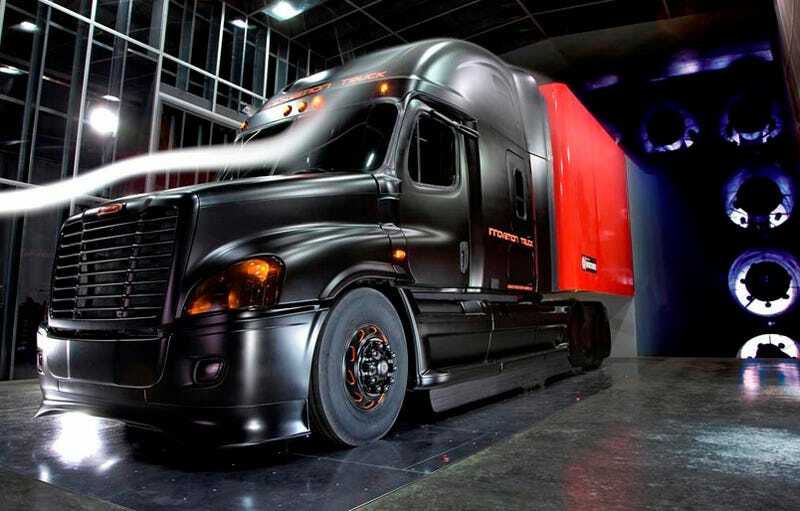 Looking like something from a dystopian trucking future, the Freightliner Cascadia "Innovation Truck" debuted at the Mid-America Trucking Show in flat-black aerodynamic bodywork. Low drag isn't the only trick on this truck. In addition to the snazzy set of spats down the side, air dam up front, underbody aero panels, and rear-view cameras replacing the mirrors, there are other tidbits on the Innovation Truck that push the efficiency envelope. The truck uses a system called "Dual Ride Height" which lowers the truck at highway speeds to further lower drag. Another area of improvement is a set of batteries to power the cab systems when the truck is parked overnight, using stored energy instead of idling the engine to run the HVAC and entertainment systems. Not included is a system to force truckers to properly cover their load of gravel so it doesn't crack our windshields. PORTLAND, Ore. – Building upon its extensive history in developing pioneering solutions, Daimler Trucks North America (DTNA) is previewing the latest technologies on a new Innovation Truck at the Mid-America Trucking Show. The Innovation Truck features advanced technologies directly from DTNA's development labs. It takes Freightliner Trucks' most aerodynamic solution – the Cascadia™ – and adds a sampling of cutting-edge advancements that will further enhance fuel economy. "We've created the new Innovation Truck to highlight not only our existing technologies, but to show our customers what they can expect from us in the near future," said Elmar Boeckenhoff, senior vice president, Engineering and Technology for Daimler Trucks North America. "The Innovation Truck is part of our ongoing effort to shape future transportation by pushing the boundaries in engineering and technology." Since its inception more than 60 years ago, DTNA has been committed to its core values of innovation, quality and meeting customers' needs. From its initial launch of the industry's first lightweight aluminum cab to the unveiling of the Cascadia in 2007, DTNA has continued to develop products that push the boundaries to enhance the driving experience and impact the bottom line. "We always combine our extensive global engineering resources with our proven industry knowledge to create smart solutions," said Boeckenhoff. "We build all of our products with the customer in mind, and the Innovation Truck is no exception." The Innovation Truck also replaces the mirrors with side view cameras to further reduce drag. The camera system improves the field of view, eliminates blind spots, and reduces the typical "fish eye" effect. Together these enhancements improve the airflow over, under, and around the vehicle – resulting in further fuel savings. "What makes the Innovation Truck so aerodynamic is not just its shape, but the entire package – from bumper to tail lights," said Boeckenhoff. Mechatronics integrates the electronic and mechanical worlds into systems that help to improve vehicle function and driver interaction. "The RunSmart Predictive Cruise system showcases our commitment to shape the future of transportation," said Boeckenhoff. "And with Freightliner, the future starts right now." Further pushing the aerodynamic envelope, the Innovation Truck integrates a Dual Ride Height system that, at highway speeds, lowers the tractor height, reducing under chassis drag. This system utilizes a proprietary front air suspension in conjunction with Freightliner's popular rear air suspension. "Aerodynamic drag reduction is at the foundation of DTNA's engineering efforts, but decreasing friction can also result in fuel economy savings," said Boeckenhoff. The Innovation Truck is configured with a single drive axle that is complemented with a load management system that can transfer weight to the drive axle in low traction situations. This configuration also reduces weight and cost. Tire pressure monitoring is another important part of keeping a truck as fuel efficient as possible, and the Innovation Truck features the newest option – a wireless SmarTire tire pressure monitoring system integrated with a Lectronix T7000 navigation/infotainment unit. This system not only more accurately reports tire pressure, but it also features an integrated display that simplifies pressure checks. The Innovation Truck is EPA 2010 emissions compliant using Daimler's proven BlueTec® emissions technology. The exhaust after-treatment system is packaged under the right-hand step, and a diesel exhaust fluid reservoir is mounted on the left hand forward frame rail. BlueTec provides a solution for the new emission standards while improving fuel economy. The ParkSmart™ HVAC System featured on the Innovation Truck is now available for the Cascadia. The system provides an integrated system solution for emission-free cooling and highly efficient heating without engine idling. Operating from a second bank of batteries, the ParkSmart system provides 8-10 hours of cooling and up to 34 hours in the heating mode, using a diesel-fired coolant heater. The advantage of an electrically-driven HVAC system is that shore power extends operating time while eliminating emissions. As showcased on the Innovation Truck, a fuel cell that produces 3-5 kilowatts of power is enough power to operate convenience items during a 34-hour reset period. "While the concept of the Innovation Truck is forward-thinking, many of these technologies are available right now or will be within this year," said Boeckenhoff. "We at Daimler Trucks North America are committed to leading the way into the future of trucking with outstanding fuel efficiency and customer-focused, innovative technologies. With us, the future is closer than you may think."